Question of the Month 18 www.seniorshousingbusiness.com Seniors Housing Business n October-November 2017 How do you know when it's time to start a redevelopment or repositioning project for a community? Value is the key to the future By Rick Banas Vice President of Development, Positioning Gardant Management Solutions Signs manifest themselves in a variety of ways and usually culmi- nate in a significant drop in occu- pancy if ignored. Signs include changes in what people are saying about the com- munity, referral patterns, the rea- sons cited for not moving in, and competitive environment. Two of the factors I believe will create the need for redevelop- ment or repositioning in coming years are the growing push toward managed care and all the indica- tions that a significant percentage of Baby Boomers are ill-prepared financially for retirement. The focus will be on value and meeting needs versus wants. Don't wait until it's too late By Adam J. Kaplan Founder & CEO Solera Senior Living It's likely too late to start preparing for a redevelopment project if perfor- mance has started to slide or a new competitor or an expansion has been announced. Strategic operators are proactive in planning for full-scale renova- tions every seven to 10 years in order to enhance the marketability, drive resident and family satisfac- tion and increase team member engagement. Additionally, as part of the annual business planning process, the team should critically analyze the operations in tandem with the local market fundamentals to vali- date if the unit mix and levels of care are optimized. Watch for performance dips By Thomas H. Grape Chairman & CEO Benchmark Senior Living The best indicators for when it's time to revisit the positioning of a project are when we see occupancy declin- ing, less enthusiastic feedback from customers, or new competitors opening that change the position- ing of our project in a marketplace. The changes we would consider would be whether we should revisit the pricing and unit mix or consider programmatic changes like converting units from one use to another (i.e. assisted living to memory care). We may also reposition the com- munity by forming strategic affili- ations or by investing significant capital expenditure dollars to "refresh" the community to make it more contemporary. Work on a regular schedule By Ted MacBeth Vice President, Director of Project Development LCS Development If your community hasn't completed any type of rede- velopment in the last five to seven years, you're at risk of falling behind in your marketplace. Proactive community lead- ers and boards of directors see the greatest success at maintain- ing and growing market share by planning ahead to meet and exceed consumer expectations. Don't wait until your community experiences an operations chal- lenge with declining occupancy or new competition entering the marketplace. Your community should have a master plan in place with com- prehensive steps plotting out your community's future. INTERFACE SENIORS HOUSING WEST e 4th Annual SAVE THE DATE! REGISTRATION & GENERAL INFO: Alicia Turlington • 404-832-8262 • aturlington@francemediainc.com SPONSORSHIP & SPEAKING INFO: Rich Kelley • 914-468-0818 • rkelley@francemediainc.com Eric Goldberg • 404-832-8262 • egoldberg@francemediainc.com • Eight panel sessions and a keynote address • Five-plus hours of networking • Conference opening cocktail party, Feb. 28 • 300-plus seniors housing executives from the West Coast • 40-Plus Speakers Must Attend Event for those active in seniors housing on the West Coast! 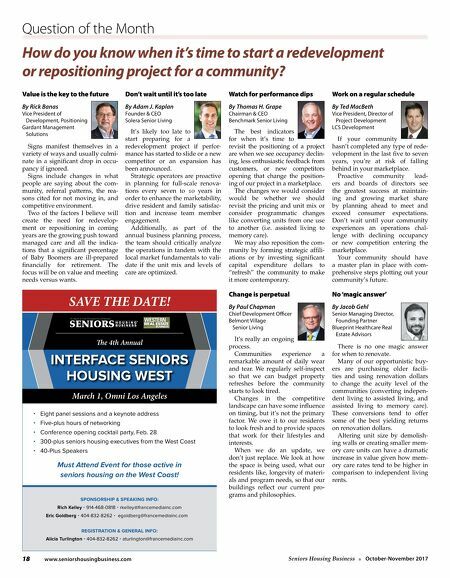 March 1, Omni Los Angeles Change is perpetual By Paul Chapman Chief Development Officer Belmont Village Senior Living It's really an ongoing process. Communities experience a remarkable amount of daily wear and tear. We regularly self-inspect so that we can budget property refreshes before the community starts to look tired. Changes in the competitive landscape can have some influence on timing, but it's not the primary factor. We owe it to our residents to look fresh and to provide spaces that work for their lifestyles and interests. When we do an update, we don't just replace. We look at how the space is being used, what our residents like, longevity of materi- als and program needs, so that our buildings reflect our current pro- grams and philosophies. 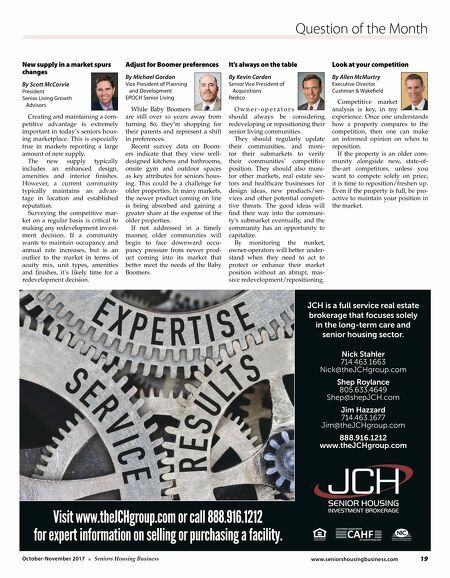 No 'magic answer' By Jacob Gehl Senior Managing Director, Founding Partner Blueprint Healthcare Real Estate Advisors There is no one magic answer for when to renovate. Many of our opportunistic buy- ers are purchasing older facili- ties and using renovation dollars to change the acuity level of the communities (converting indepen- dent living to assisted living, and assisted living to memory care). These conversions tend to offer some of the best yielding returns on renovation dollars. Altering unit size by demolish- ing walls or creating smaller mem- ory care units can have a dramatic increase in value given how mem- ory care rates tend to be higher in comparison to independent living rents.